Dedicated to making your Eye Care easier! See your Eye greatly magnified, well lit with fantastic clarity for all of your Eye Care. It is our mission to help people to help themselves where possible, with their eye problems. UPDATEs: 25th May Roy came through his OPEN HEART surgery OK but it will be a very long healing process, with quite a few complications. December : The healing process continues but Roy has ongoing heath issues plus NOW a cracked rib. February: Roy has had another trip to hospital BUT is on the mend again. It has been 1 step forward and two backwards ....going forward at present! YAH ! We appreciate your prayers and good wishes. Roy's health is of the utmost importance right now. We are temporarily out of stock of Own Eye Magnifiers. Stock is being made and should be ready early March. We apologise sincerely for the very long delay and thank you for your patience. Thank you also for your good wishes for Roy, I pass them all along. Apologies for the inconvenience with delays. Introducing the unique Own Eye TM Magnifier Mirror. Click on the arrow to watch our video. This magnifying eye mirror is a new approach to Eye Care, being the only instrument purposely made for all your Eye Care & Eye Health concerns. It is compact and portable on a hands-free stand making it perfect for travelling anywhere. INSTANT RELIEF from trichaisis/ingrown eyelashes is a reality at last. Stop dreaming ....it really is possible and SO easy to do it yourself at home....no more pain and frustration! Now you can remove your own ingrowing eyelashes SAFELY, quickly and easily ANYWHERE, without resorting to surgery or medical procedures. It really works, we guarantee it! Used successfully by people all over the World. It pays for itself in no time. * Just THREE trips saved going to my own Eye Specialist , at $90 a visit to remove ingrown eyelashes and the Own Eye Magnifier paid for itself! The time, pain and money you WILL save is absolutely invaluable. All types on Eye Care is so much easier and safer when you can see what you are doing. You will be able to see incredibly well, even those tiny white eyelashes will be clearly visible. If you suffer from Trichaisis this means that you can easily remove painful ingrown eyelashes SAFELY, quickly and effortlessly yourself, anytime and anywhere. NO electricity needed, lights are powered by long life batteries! We have been told by numerous customers that they really value the fact that they are able to travel and go on holidays once more with complete confidence that their ingrown eyelashes will not be a HUGE problem whilst away. Having to find someone reliable AND capable to remove eyelashes is a worrying problem and when the eyelashes stick into the eye it is necessary to have them removed quickly! They can damage the eye if left untreated. There is a simple solution to this frustrating problem. An Own Eye Magnifier allows you to remove your own ingrown eyelashes at any time, where ever you are ...even remote areas, as no electricity is needed. People with normal vision or those with very poor eyesight, can now see their eyes in amazing detail WITHOUT their glasses on. Even with your glasses off, you can see your own eyes in focus and better than you ever thought possible. You can actually see MUCH more eye detail in this mirror lens WITHOUT wearing your glasses than with them on! Sounds impossible, but it is true! Seeing really is believing. People with normal eyesight find this instrument indispensible too. Nothing else performs as well, that's a promise. This testimonial came on 2nd April 2017. "For years I had been using a small magnifying glass with a mirror to help find and remove lashes. We've sold many to USA & Canada and to many countries including UK, Ireland, New Zealand, Brazil, Poland, Malaysia, Luxembourg, Malta, Singapore, Saudi Arabia, Bermuda, Hungary, Portugal and to South Africa. Leading USA Eye Specialists & Eye Health Educators, Dr Randall Thomas and Dr Ron Melton freely endorse & recommend Own Eye Magnifier Mirror for all eye care. They promote the Own Eye Magnifier to other Eye Professionals all around the World. Here is what they have to say: "This device could be a God-send for thousands of afflicted patients with trichaisis......" "The views of my own eye look very much like when I view my patient's eye through my $16,000.00 slit lamp each and every day! WOW, what a view." To read the full quote, please go to our Testimonial page. Is this Blurred Vision and tiny image what you see in your normal mirror when you remove your prescription Glasses/spectacles? Would you like to be able to see your eyes clearly and greatly magnified WITHOUT your Glasses on? Read on & we'll tell you how ! ** Please note that this is a digital photo and is NOT clear or as detailed as the image seen in the Own Eye Magnifier Mirror lens! You will be amazed at the clarity. You really will be amazed at just how much detail you can see! 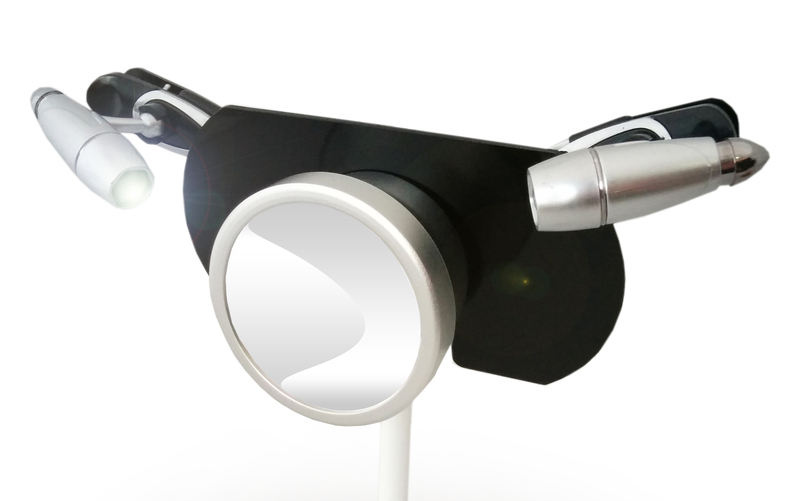 The Universal Own Eye Magnifier has an ultra powerful magnification mirror lens and the brilliant twin LED lights swivel 360 degrees and tilt to allow you to see all areas of each eye in amazing detail and with total clarity, even if your eyesight is very poor. The Own Eye Magnifier has the MOST powerful magnifying mirror lens available today and the bright safe lights illuminate your eye in EXACTLY the right place so you can see to do all types of eye care even if you don’t have good eyesight. You have to see it to believe it! This Eye Care Magnifier Mirror allows you to see your own eyes greatly magnified so you can see CLEARLY to do all your of own eye care, WITHOUT your glasses / spectacles on, even with really poor eyesight. The bright across eyes lighting is SAFE yet illuminates exactly where you need it. The VERY LARGE and astonishingly detailed view of your eye is ideal for a variety of eye care uses. INSTANT relief from ingrown eyelashes/ trichaisis is now possible, you can remove them yourself quickly and SAFELY at home....right NOW! Have your eyes been sore, watery & red for ages without finding what is wrong? It is possible that you actually have ingrown eyelashes but they are hard to see in an ordinary mirror. Ask your GP or Eye Professional to check for you. People sometimes don't realise they have trichaisis/ ingrown eyelashes. If you have trichaisis/ ingrown eyelashes, are they becoming more and more of a problem…perhaps you are worrying about them scratching your cornea? You should be worried! That constant scratching could be causing damage to your precious eyes…can even lead to permanent vision impairment! Trichaisis/ ingrown eyelashes is an ONGOING condition…no real solution other than removal of the offending eyelashes! That is the reality. Most other solutions offered are only temporary…eyelashes often DO grow back! The pain can be intolerable. Does it really annoy you that you need to have someone else remove your irritating and painful ingrown eyelashes, having to wait until you can get an appointment? Do you wish you didn’t need to depend on an Eye Specialist /optometrist/ optician or your GP for what takes them a few seconds and costs you money? Does it worry you that you have to pay for EVERY ingrown eyelash that has to be removed? Perhaps you have been told by an Eye Professional that you need a “procedure” that not only worries you, BUT it may have to be repeated…if it isn’t successful the first time! Sometimes it just does not work. Great news there really is a better way… please keep reading. Wouldn’t it be fantastic to be totally independent and to be able to remove your ingrown eyelashes yourself, whenever you need to and where ever you are, at home, at work…on holidays, EVEN overseas or in remote areas? The CONSTANT pain and irritation, not to mention cost of having those annoying little eyelashes removed is no longer necessary! There really is no need to SUFFER any longer! You HONESTLY can take control of your own eye care! Do it yourself and be TOTALLY independent. The Own Eye Magnifier is a simple solution.… it is an easy, SAFE and fast solution to your ingrown eyelash and all of your eye care problems! INSTANT relief from Trichaisis/ ingrown eyelashes IS possible, you can remove them yourself quickly and SAFELY....right NOW at home or when on holiday... even overseas! This product saves you time, PAIN & FRUSTRATION as well as money, plus it is just SO EASY to use and it is perfectly SAFE. You REALLY can remove your own ingrown eyelashes WHEN and WHERE you need to…NOW! One purchase and you won't have to pay anyone to remove your painful eyelashes ever again! It pays for itself in no time. 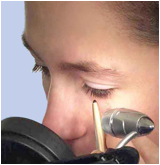 Eyes and Ingrown Eyelashes are greatly magnified with absolute clarity. Customers tell us that they haven't ever viewed their eye this close-up before they used Own Eye Magnifier. They tell us that they often felt there were still ingrowing eyelashes present even after having them removed by an Eye Professional.You will be amazed at just how many eyelashes ARE sticking into your eye...no wonder you have sore eyes! See every single eyelash in the Own Eye Magnifier. It REALLY works…we guarantee it! It is truly fantastic! and is the first and only one of its kind anywhere! Sold World-wide including in USA, Canada, UK, Australia, New Zealand, Brazil, Poland, Saudi Arabia, Malaysia, S Africa, Thailand, Bermuda, Singapore, Ireland, and Europe to name some countries. So, anyways, it arrived today and IT IS AMAZING! I was so excited I took it right out of the box and I just spent 20 minutes pulling so many lashes that I had been unable to even see, let alone get the tweezers on. You are right, this was surely a wonderful gift your husband gave you. I am so thankful that he made it available to the rest of us. JUST WONDERFUL!!! Martin a precision engineer, was so impressed with our "wonderful and well made product" that he PHONED from South Africa to tell us. He says he has suffered ingrown eyelashes for many years and was delighted to finally find a product that works and helps him to be in control of his eyelashes at last! Another wonderful testimonial received from Canada. Thanks so much for everything including the advice. It shows you care about your customers and your product. Good work! Forever grateful, J. L. Fredericton, NB Canada"
** These are just a sample of Testimonials we've received about the Own Eye Magnifier. There are lots more if you go to the Testimonail Page. Close-up Eye View for all eye care. PRICE: $250 now includes $50 worth of accessories. PLEASE NOTE: Due to family illness we are unable to process orders until after 17th June. Roy is having major surgery. Apologies for the inconvenience. The same price since 2007 and now with complimentary accessories at no extra cost! The answer to ALL of your eye care problems is the truly amazing and innovative Own Eye Magnifier Mirror which is proven to work by hundreds of people Worldwide! You can be in control of all of your own eye care at last! The Own Eye Magnifier Mirror is so convenient and easy to use, being portable and compact with a hands-free stand, perfect for travelling anywhere! It pays for itself in no time. Ingrown eyelashes are so easy to see in the mirror lens but good tweezers are essential to remove your own ingrowing eyelashes! With every Own Eye Magnifier we now include a pair of safe and effective eyelash tweezers with rounded ends, modified in our workshop. You really CAN remove your own ingrown eyelashes, providing you have steady hands. Be independent, take care of your own eyelashes any time and anywhere. It is so liberating not to have to wait for someone else to free you from the pain! Be in control of your Trichaisis. NO electrical power is required as the twin LED lights use long life batteries. Special eyelash tweezers, with safe & effective rounded ends modified in our workshop. NB: The Own Eye Magnifier is NOT a replacement for your glasses but is an essential aid for all of your eye care needs. Approximate size view you see, depending on your eyesight. However, you can actually see MUCH more eye detail in this mirror lens WITHOUT wearing your glasses than with them on! Sounds impossible but it is true! To overcome the blurred vision that you have very close up, this unique magnifying mirror allows you to once again see more fine detail in your own eyes than you've seen in years. Even people with good eyesight have great difficulty seeing their own eyes in an ordinary mirror close up without blurring, at a distance of less than 5 inches or 125mm, in the area we call the “blurred zone”, try it yourself. The majority of people do not see clearly in this “blurred zone” and that is where all forms of eye care needs to be done. People with Sore Eyes, Blepharitis/ eye infections, Dry Eyes, Ingrown Eyelashes /Trichiasis, Allergy Eyes & other Eye Problems find this unique Eye Magnifying mirror essential. Help IS available! It really works and brings self-help Eye Care to so many people Wordwide. Please seek advice from your Eye Care Professional if you have eye care health concerns. However, your Eye Professional may not have heard about this fantastic product yet. Roy has recently developed a Dominant Eye Shield which is included when you buy a Magnifier. If you have a problem seeing into one eye at a time, it could be that your dominant eye is taking over. This magic little shield "blocks out" the other eye so that you can now keep both eyes wide open when using the Own Eye Magnifier Mirror. The Universal Own Eye Magnifier comes with a 5-year guarantee on quality with a 14 days money back offer if you are not completely satisfied. Please see out Policy Page. If you have any Eye Care Health concerns, this eye aid is one indespensible product that is perfect for you. The Own Eye Magnifier is so convenient, very effective and easy to use that really will save you a great deal of money. Be totally independent! For any questions or advice, we are always happy to help you. "Stop Dreaming Technology Pty Ltd."
Manufacturers of Own Eye TM Magnifier Sole Manufacturers Worldwide. Initial Lenses were made by Darryl Brown. Blue eye photo by "© Andrey Armyagov Dreamstime"